as the nights draw in, the sun loses any semblance of heat that it may have owned (pretty much gone un-noticed up here), and the rain starts to alter its trajectory from straight up and down towards a more horizontal stance, egged on by amber weather warnings (a feature that seems to have emerged from nowhere), a cyclist's thoughts turn to soft and fluffy. externally, of course, there is face to be saved, hardness to be portrayed and flandrian character to be impressed upon any innocent bystander that can be found close at hand. it's a period of transition that need result in a re-filing of one's cycling wardrobe. for those short sleeve jerseys are no longer man enough for the task, even though they have seldom been removed from the hangers during so-called summertime. 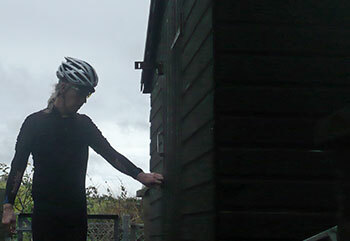 now it is surely time for the long sleeved jersey, perhaps even concealed beneath a weatherproof outer shell. that will likely be our metier for the coming six months, but during this transition period, weather forecasts can go horribly awry, leading to moments of serious indecision and a delay in approaching the bikeshed. the ambient conditions can often be six of one and half a dozen of another, which is sort of where the ever faithful armwarmer has found its niche. where would we be without them? there is a surprising variation in the efficacy of the humble armwarmer, through each iteration of its varying fabric construction, length from upper arm to wrist and the tenacity with which the hapless garment clings to those upper limbs. i cannot be the only one who has suffered from the ignominious strains of sniggering at the rear of the peleton when that embarrasing portion of white skin shows between jersey sleeve and ruffled armwarmer top? it is of great consequence that any superlative effort need be restrained lest this humiliation be made plain in that final sprint. thus, that simple tube of logo'd fabric has appearances to maintain, gaining a degree of importance perhaps not suggested by its price on the website. prendas ciclismo have long been the kings of maintaining the honed athlete's sense of decorum, leaning heavily on no-frills practicality at a price that has me wondering if andy's keyboard is malfunctioning. in order to be something of a devil's advocate towards the review item, and much to the amusement of passing motorists, i was wont to flail my arms in a verisimiltude of beckoning the team car from the next village while scratching the back of my head. however, eccentric such behaviour may have seemed from behind the triplex windscreen, i was manfully attempting to dislodge either armwarmer from its tenacious grip. it is of great comfort and style that i failed miserably. but practicality need not be gained at the expense of rudimentary appearance, and keen to maintain not only my hard-won sense of style, but to extend those feelings of soft and fluffy, a pair of oversocks seemed the ideal accomplice for that belgian persona. if life were so basic, it would surely be a simple matter of purchasing extra large socks and cutting out a couple of well-placed holes in the bottom. but of course, well intentioned plans have a tendency to remain in the realm of the well-intentioned, rarely seeing the light of day. aside from that, unless you ride in a peloton of one and your coffee stop is a phone box, you will likely wish to affirm a more refined sense of style and pragmatism. it is therefore surely a deal more considerate to ensconce those leather shod feet inside oversocks that are form-fitting and show immediate sense of purpose. once again, prendas ciclismo are two steps ahead (pun intended), offering all but matching accoutrements for those hardened armwarmers. in similar manner to their upper limb compatriots, meraklon is the primary constituent, ensuring an incredible degree of form hugging along with a high degree of wear resistance. they're also remarkably soft to the touch; us hardened cyclists are prone to the occasional cossetting. well, quite a lot of cossetting actually. the soles are already cut to clear both roadgoing triangular cleats and those tiny little slivers of metal that keep feet on cyclocross pedals. if it rains, they'll get wet, but notably retain their shape throughout any level of soaking you may wish to throw at them. the importance of this in the coffee stop cannot be overestimated. people will notice. i doubt too many of you will rail against the thought of a sandwich, a state of being conditioned over hundreds of years. surely the ultimate degree of layering. but if i may, for a moment, sway you away from that peanut butter and jelly, consider a sandwich that has more to do with the topic of conversation than bread and filling. if you accept that the cosiness of my toes is all but ensured against the elements by those prendas oversocks, with appropriate footwear below, placing a pair of thermo cool socks as the ground on which stability is based cannot be seen as other than a good idea. 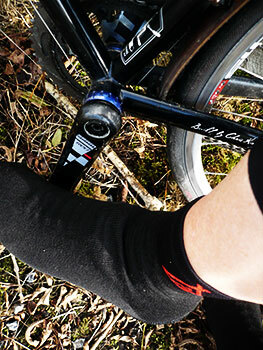 purporting to incorporate strands of carbon, these are surely the ideal footwear for the perennial cyclist. this resistex incorporation has, of course, purpose other than to satisfy the ego of the average modern cyclist. 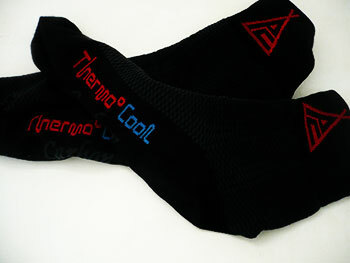 hard worn socks have a tendency to feature gaps in the firmament, if you gather my meaning; the carbon resistex fends well for itself, while the coolmax regulates temperature within the 0-12 degree range. for only a few pence short of £24, all three items can be yours, and possibly for even less if you mix and match with one of prendas' special offers. the cost of each, and in varying colours for the oversocks and armwarmers, is an impressive £7.95 buy yours now before andy really does discover there's a key stuck on his computer.